Summary HomePlug AV2-MIMO adapter based on Qualcomm's QCA7500 chipset. Also available with pass through outlet (PLP1200). 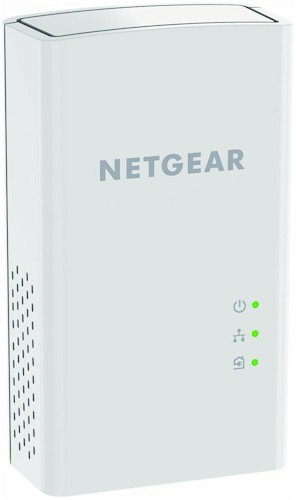 Like the ZyXEL PLA5405, and TRENDnet TPL-420E, NETGEAR's PL1200 is advertised as a "1200 Mbps" adapter. This marketing-speak indicates the PL1200 uses Qualcomm's QCA7500, making it the third such product we've reviewed. The PL1200 is similar in height to other AV2 MIMO adapters, but a bit slimmer. The photo below shows it won't block the adjacent outlet in a standard U.S. duplex. The serial number label specs a 100 - 240 VAC 50/60 Hz operating range. The callout diagram below shows the adapter supports tri-color HomePlug link quality indication. The single Gigabit Ethernet port is on the bottom of the adapter, with the Reset and Encryption buttons sitting to its right. The User Guide says the adapter goes into power-saving mode after 5 minutes of Ethernet inactivity and powers up again when activity resumes. I verified this by the following procedure, which ran without a hitch. Waited until the Ethernet unplugged PL1200 entered power-save. Plugged Ethernet back in and verified that adapter powered up and ping returns resumed within a few seconds. As noted earlier, the PL1200 is the third sighting of Qualcomm's QCA7500 HomePlug AV2 MIMO IC. Check the PLA5405 review if you'd like to see the device block diagram, or download the data sheet. The inside photo shows the QCA7500 at lower center. That's an AR8035 Gigabit Ethernet PHY to its left. There is no separate analog front end (AFE) device. The plastic case has ventilation holes on each side, toward the bottom. The adapter didn't get particularly warm during operation. There is no utility shipped with the product or available for download from the product's support page. But since it uses the QCA7500, TRENDnet's PowerPacket Utility available from the TPL-420E2K's support page worked just fine with the PL1200. Near as I can tell, the 2.0.0.375-03-20141016 firmware is the same used on the TRENDnet TPL-420E2K. The 884 Mbps link rate shown is with two adapters plugged into the same unfiltered power strip. I tested the PL1200 using our standard powerline test procedure, with all results entered into the Powerline Performance Charts. I pulled all four MIMO AV2 class products tested so far into the comparison charts, i.e. the PL1200, TRENDnet TPL-420E2K, D-Link DHP-701AV and ZyXEL PLA5405KIT. Note the D-Link is the only one of this group using Broadcom's BCM60500 AV2 MIMO device. The other three use QCA's QCA7500. The Downlink Throughput plot below shows the PL1200's same outlet 391 Mbps Location A throughput second only to TRENDnet's TPL-420E2K, which remains on shipment hold due to manufacturing problems. But in the other two locations, the PL1200 matches the other QCA-based products. Only in Location C does the Broadcom-based D-Link shine. Looking at the composite IxChariot downlink plot shows nice steady throughput in all three locations. The jump at the beginning of the plot is the IxChariot Nagle's algorithm quirk. For uplink, the PL1200 isn't the best of the bunch in any of the three test locations, maxing out at only 362 Mbps. The uplink IxChariot plot shows high variation in Location A, but smooth sailing in the other two test locations. The PL1200's simultaneous up /downlink IxChariot plot shows higher average downlink throughput than uplink, but both battling for dominance. Still, the 460 Mbps total throughput is a nice increase from the sub 400 Mbps unidirectional results. Adding another simultaneous stream pair gained another 20 Mbps or so for 482 Mbps of total throughput. Noise tests run in Location E showed the PL1200 reacts quickly when a noise source is removed, but doesn't otherwise adapt. The light green bottom trace shows throughput with a noise source plugged in for the duration of the test run. There's basically no increase in throughput over the run, which indicates the adapter isn't working around the noise. If it had, we should expect to see throughput move up on the bottom trace. The middle trace shows a quick response when the noise source is unplugged at the 30 second mark. Throughput quickly moves from the lower throughput (noise source plugged in) to run with the top trace (noise source removed for the entire run). Due to the TRENDnet TPL-420E2K HomePlug Powerline 1200 AV2 Adapter Kit retest, the PL1200 earns a #1 performance rank for AV2-MIMO powerline adapters. The TP-LINK TL-PA8030P now also shares the #1 rank. Using our new simplified classing, the Powerline Ranker slots the PL1200 #2 of four AV2-MIMO products tested. Using the Location E downlink criteria suggested in the D-LINK DHP-701AV review, the PL1200 rates pretty well, in second place. For uplink, it comes in third. But at $80, it's the most aggressively priced AV2-MIMO powerline adapter kit so far, followed closely by ZyXEL's PLA5405KIT at $82 that ranks fourth among four AV2-MIMO adapters tested so far.